So much has been written by and about Winston Churchill that it is difficult to do him justice or write anything new about him in a single volume. 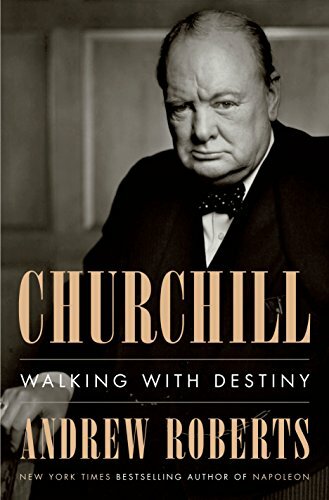 Historian Andrew Roberts does both, however, in his new book Churchill: Walking with Destiny. In page after page of Roberts’ new biography, he proves that Churchill’s “past life” had indeed prepared him to lead Britain during its darkest hours. It bears repeating that in May 1940, Britain’s survival was at risk as never before. Neither Louis XIV nor Napoleon nor Kaiser Wilhelm II had posed as great an existential threat to Britain as Hitler’s Germany. Roberts benefitted from “unfettered access” to King George VI’s wartime diaries, the Chequers visitors’ books during Churchill’s premierships, the Other Club records (where Churchill associated with famous British), Churchill’s wartime monthly engagement cards, numerous unpublished memoirs and diaries, and the transcripts of War Cabinet meetings. Winston Churchill was born on November 30, 1874, at Blenheim Palace, the ancestral home of the Duke of Marlborough. The palace was named for one of General John Churchill’s greatest military victories in the War of the Spanish Succession in 1704. Winston later wrote a four-volume biography of Marlborough, which is considered one of his best books and a window into Winston’s worldview. Winston was the son of Randolph Churchill, a prominent member of Parliament, who rose to be Chancellor of the Exchequer in Lord Salisbury’s government in the late 19th century and was thought to be his heir apparent. Randolph’s political career, however, ended when he resigned after a clash with Salisbury over the military budget. Roberts notes that by that time Randolph was suffering from an incurable brain disease that was misdiagnosed as syphilis. He died at age 45. Winston Churchill’s mother was an American beauty and social climber, Jennie Jerome. Neither she nor Randolph had much time for Winston; he was reared as a child by his nanny, Elizabeth Ann Everest. Churchill attended school at Harrow and Sandhurst in anticipation of a military career. His schooling, Roberts writes, taught him reverence for British history and the great men (and women) who built and ran the empire. Churchill later wrote about those leaders in his four-volume A History of the English-Speaking Peoples. Churchill believed from a young age that he was a man of destiny. “Few have set out with more cold-blooded deliberation to become first a hero and then a Great Man,” Roberts writes. He attributes some of this to Churchill’s belief that he, like his father, would die at a young age. Roberts notes that Randolph’s sisters died at ages 45 and 51, and another brother died at age 48. As a soldier, Churchill sought combat but always with an eye on how such experiences would help promote a political career. He fought in Cuba, on the Northwest Frontier (India), in the Sudan, and in southern Africa, repeatedly demonstrating courage under fire. He also wrote about these experiences in newspaper and magazine articles and books. These early military experiences and his writings about them brought Churchill more than fame. They began a process that Roberts mentions throughout the book whereby experience and study, and the lessons learned therefrom, shaped Churchill’s worldview. Churchill had also developed tremendous self-confidence, and “had shown a great deal of moral as well as physical courage.” He soon developed an ability to speak well in public—something that he would later hone to perfection when tried to warn Britain and the world about the Nazi threat in the 1930s and when, in Edward R. Murrow’s words, he “mobilized the English language and sent it into battle” during the Second World War. Roberts describes Churchill as a “Tory democrat” and a “liberal imperialist” who, like his father and Disraeli, wished to conserve the Empire and make living easier for the average British person at home. This, and a hunger for office, led him to switch to the Liberal Party in 1904. He served in the Colonial Office and as Home Secretary. He championed social reform but also acted to enforce the laws and restore order when assemblies and labor strikes turned violent. Churchill created a Naval War Staff and focused it on mobilization, intelligence, and operations. He shifted the Navy’s fuel from coal to oil. He created the Royal Navy Air Service and anticipated strategic bombing behind enemy lines. He oversaw the development of signals intelligence and understood the importance of submarine warfare. His attention to detail and seemingly endless energy astonished those around him. He was described then, as he would be described during the Second World War, as a human dynamo. Churchill’s fertile mind sought ways to end the stalemate and slaughter of the Western Front. One result was the development of the tank; another was the disastrous Dardanelles campaign, which led to his removal from the War Cabinet. There was, of course, more to it than that. Churchill had made plenty of political enemies and when the Dardanelles expedition failed, his enemies pounced. Yet throughout his long political career, Roberts notes, Churchill rarely held grudges for very long. The experience of the Dardanelles also taught Churchill valuable lessons about unity of command and respecting the judgment of military professionals, lessons he would put to good use during the Second World War. After six months at the front, Churchill returned to Parliament and served as Minister of Munitions until the end of the war. After the horrendous losses of the Battle of the Somme in 1916, notes Roberts, Churchill circulated a paper to the War Cabinet suggesting more widespread use of tanks, railway artillery, mortars, bombing from the air, and the development of artificial floating harbors—all tactics that would become commonplace in the next war. Churchill, it is well known, loathed communism, and after the war he suggested that Lenin’s new Bolshevik regime in Russia be overthrown by the allied powers. Less well known, however, is Churchill’s memorandum of April 1918 in which he proposed that Britain should reach out to Lenin in an effort to persuade the Bolsheviks to renege on the Treaty of Brest-Litovsk, foreshadowing, Roberts notes, Churchill’s alliance with Stalin more than two decades later. As he would do after the Second World War, Churchill after the First World War wrote a multi-volume history of the war entitled The World Crisis. Like his later history, The World Crisis was Churchill’s “take” on the war, which unsurprisingly put him in the most favorable light. During the 1920s, Churchill switched back to the Conservative Party and was rewarded by being named Chancellor of the Exchequer, an office once held by his father. This second change of Party, Roberts notes, made Churchill more enemies and increased the level of distrust in him across party lines. That widespread enmity and distrust led to Churchill’s years in the political wilderness in the 1930s, when successive Conservative governments refused him office. Churchill reinforced that enmity and distrust by resisting moves toward the independence of India and championing the undeserving Edward VIII during the abdication crisis. Roberts’ retelling of Churchill’s ascension to wartime leadership is compelling but familiar. He adds to the history of Churchill’s leadership during the Second World War by making deft use of George VI’s diaries and the War Cabinet transcripts. Churchill combined realism, ruthlessness, and moral courage to become the greatest democratic war leader in history. Roberts previously covered much of this history in his excellent Masters and Commanders, a book about the wartime relationships between Churchill, General Alan Brooke, Franklin Roosevelt, and General George Marshall. There is little doubt that war energized Churchill. He has been criticized as a war lover, but that misses the point. Roberts notes the many times during wartime that Churchill cried. He abhorred the suffering and devastation caused by war, yet he thrived in a wartime environment. This is a paradox that has perplexed historians and biographers alike. Most of Churchill’s heroes of history were war leaders (Marlborough, Elizabeth I, Nelson, Pitt, Wellington). He believed that this was his destiny, too. Roberts dutifully covers Churchill’s post-war warnings about the Soviet threat and his second premiership in the early-to-mid 1950s, including his complex relationship with Anthony Eden, his successor-in-waiting. Roberts notes that Churchill clung to power despite failing health because he believed it was also his destiny to facilitate a deal between Soviet Russia and the West that would ensure peace for the foreseeable future. Throughout the telling of these momentous events, the author does not neglect recounting Churchill’s loving relationship with his wife and daughters, as well as his troubled relationship with his son Randolph.